Steve, “a decidedly middle aged man,” began working with me back in February 2010. Steve has made incredible progress. His dedication and consistency has been second to none and it’s paid off for him in many ways. In addition to greatly improving his strength and conditioning, Steve has seen a direct carryover to other areas of his life, including his landscaping hobby. Steve has previously battled chronic back pain, but has seen a considerable improvement since beginning our regular workout routine twice per week. 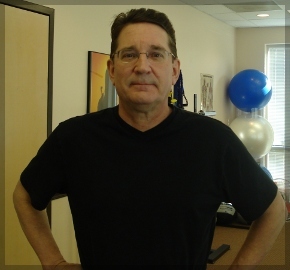 Steve also takes advantage of some of the other services here at Partners In Health & Wellness, such as massage therapy from Sallie Gentry and chiropractic care with Dr. Charles Hecht. Combined with personal training, these services allow Steve to continue towards a healthy lifestyle. I hold Steve in the highest regard. His positive attitude and easygoing nature make him a joy to work with. While he may joke about his age and ability, I see the fighter within him and know he is capable of reaching all his health and fitness goals. By the way – this guy is a phenomenal cook and I’ve enjoyed being the recipient of several of his “leftovers.” Thanks Steve!